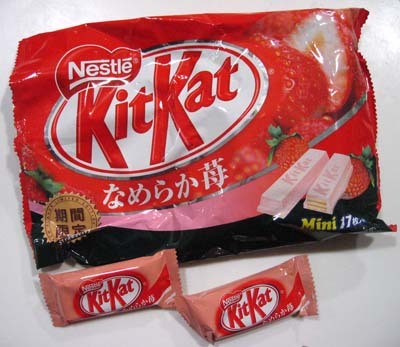 Winter Strawberry KitKat: Opening it you immediately smell that wonderful scent of Japanese strawberry flavoring. 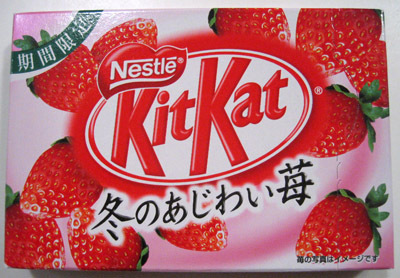 Those of you who’ve had Japanese strawberry candy before know what I mean. The flavor/smell is very distinct: fresh, sweet and powerful. I haven’t encountered a strawberry flavor like it anywhere else. The fingers are a medium coral pink color, very smooth and shiny. I was surprised to have a little of the coating melt under my touch where I picked it up for a photo! makes me wonder how this bar would stand up during the heat of summer. Thankfully it’s “winter” strawberry. The texture is smooth and creamy . The taste is so powerfully of good milky strawberry, it’s magnificent. I’m loving the intense flavor and looking inside at the KitKat I found out why: a bright pink strawberry creme site between the layers of wafer. Wow. Not only do you get strawberry from the coating but a surprise flavor blast from the inside as well. YUM! I just love this bar. The flavor is perfect and it leaves you wanting more. 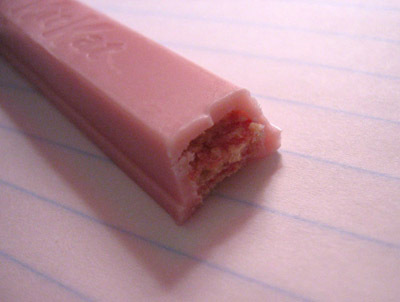 Mini Strawberry KitKat: It’s solid white pink and freckled with red bits. It smells like strawberry, but not strongly so. The taste is sweet with a tart aftertaste. It’s strange because I don’t taste much of a strawberry flavor. The sweetness dominates the bar and the rest is more “perfumey” than anything else. So what to do if you are confronted by both these tasty treats in the candy aisle? Take my advice: ignore the Mini Strawberry and go for the Winter Strawberry, you won’t be sorry. there are green te kitcats as well as coffe kitkats here in jumaria! 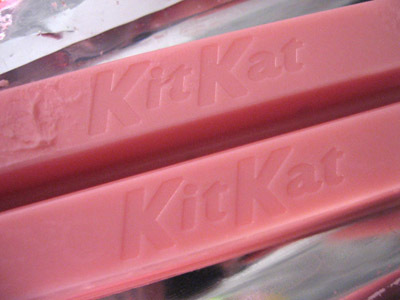 OMG I LOVE STRAWBERRY, just the look of that strawberry kitkat makes me drewl.